On his first visit to Northern Ireland as leader of the Labour Party, Jeremy Corbyn outlined his desire to see the British Irish Intergovernmental Conference (BIIC) reconvened, his willingness to prevent a hard Brexit and when questioned, his position on a border poll. 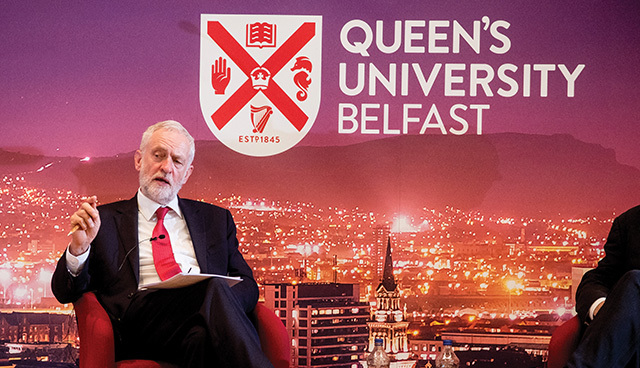 The cheers which rang out over the applause as Jeremy Corbyn took to the stage in the Whitla Hall at Queen’s University Belfast immediately signalled what had been anticipated, that the reception for his maiden speech in Northern Ireland would be from a favourable audience. At no stage did the Labour leader offer any explanation as to why it had taken the best part of two years to make the journey across the Irish Sea since taking up his post. Instead, he opened with praise for the university and name-dropping some of its most famous alumni, including Seamus Heaney, Mary McAleese and David Trimble. Corbyn is no stranger to Northern Ireland and the issues associated with it. His involvement in negotiations to end the Troubles, including with the then politically-ostracised Gerry Adams, and his stated preference for a united Ireland has not made him a favourable figure for many unionists. Undoubtedly, Corbyn was cautious not to deepen any of those political wounds, instead opting to talk up the opportunities of restored devolution in Northern Ireland. 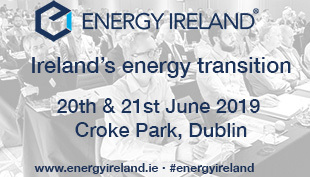 Known for his willingness to speak his mind, he did offer his outlook on the “mess” of the Brexit negotiations and called for a reconvening of the British-Irish Intergovernmental Conference. However, he had to be pressed to discuss the potential for a border poll and managed to comfortably put it on to the long finger. The majority of Corbyn’s address focussed on the Good Friday Agreement, outlining his belief that the spirit of “sacrifice” and “courage” required to forge the deal 20 years ago needs to be rediscovered once more if peace and “greater prosperity” is to be secured. He praised the communities which have solidified the agreement over the last two decades and extended recognition to the political players at the time such as Bertie Ahern, Tony Blair and Mo Mowlam. Discussing the changes that the Agreement brought about, he pointed not only to the end of violence but also reform of Northern Ireland’s political and institutional structures and a framework for north-south relations. However, he described the current status quo as a “crossroads” and articulated his desire to see the Agreement used as a “springboard for the 20 years to come”. In doing so, he emphasised Labour’s commitment to the Good Friday Agreement. Turning to Brexit, he outlined his belief that the Conservative approach posed dangers for Northern Ireland. “Driven by the free-market fantasists within their ranks, the reckless Conservative approach to Brexit is a very real threat to jobs and living standards here in Northern Ireland, and risks undermining and destabilising the cooperation and relative harmony of recent years,” he said. There was an expectation from the audience that as Corbyn took a few questions post-speech that his opinion on a border poll would be sought. When asked by a young audience participant whether it would be something he sought if elected Prime Minister, he said he was neither asking for nor advocating one. Instead, he pointed to implementing the Good Friday Agreement “to the letter”. The Agreement states that a vote can only be called if there is evidence that a majority in Northern Ireland would support reunification. In response to the question, he said: “If that is a wish then clearly such a poll would happen. I am not asking for it, I am not advocating it. What I am asking for is a return to the fullness of the Good Friday Agreement which would open up the opportunity and possibility for the future of Ireland as a whole. “That is the point of the Good Friday Agreement. Not direct rule, not imposition of a political view from Westminster but devolution of powers to Stormont here and of course the relationship with the Republic.